It’s Monday Again! I hope you’re all still hanging in here with me on my game theme. Today’s game is to Identify Songs That Feature Jealous People. 3. 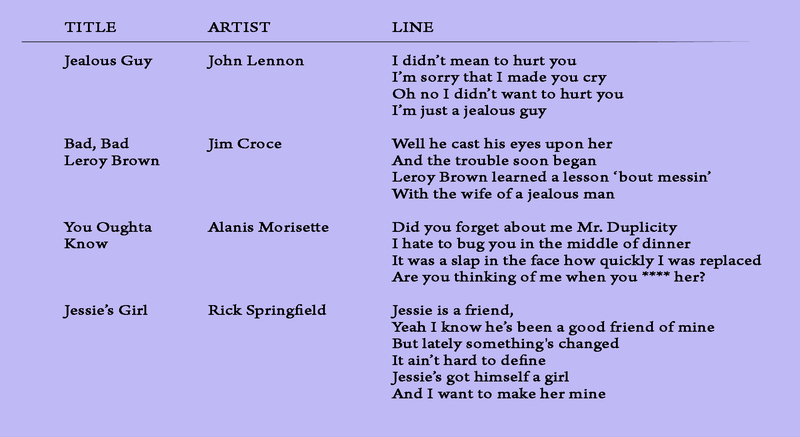 You have to include the line in the song that references jealousy. 6. The song title does NOT have to feature jealousy. So tell me… Have you ever been jealous of someone? Did you do anything about it? Was it worth it? Happy Monday! I hope you’re all still hanging in here with me on my game theme. 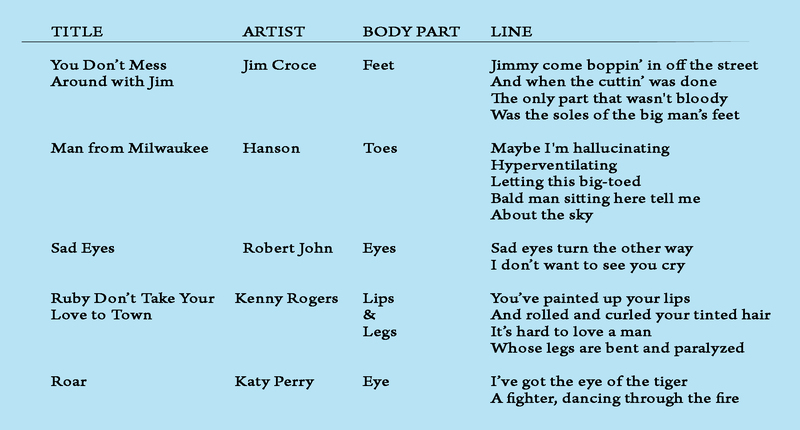 Today’s game is to Identify Songs That Name Specific Body Parts. 4. You have to include the line in the song that references the body part. 7. The song title does NOT have to feature the body part. So tell me… What kind of music do you listen to? Do you listen to your music more for the beat or the lyrics? Do you ever sing out loud when you’re alone? Well, I just know you’ve all been sitting around saying, “That Rachel has had so many exciting blog themes lately, she’s gotta break soon.” And you may be right. Then again, maybe not. I guess it depends on if you and I like the same things. My hint is this: You’re either going to love it or hate it. There probably won’t be any in between. Since summer’s over and everybody’s gone back to school now, and people have a mindset of fun being a thing of the past as they prepare for winter, I thought I’d bring some interactive levity to my blog. This month’s theme is games! More precisely, it’s interactive games. (And no, I don’t mean video games! I want you to use your brain!) Now, I’ll just warn you that at my house, we have an entire closet devoted to nothing but housing board games which we love to play. Sometimes we have company, and they have a lot of fun with us, or sometimes they feel grossly intimidated before the evening is over. Being Autistic, my mind never shuts off. It also notices a lot of patterns in things. So, often when I’m alone, I’ll see how many types of something or other I can think of. I’ve also taken more than my share of road trips in my lifetime, so my kids, my sister, and I always make up car games that we play when we drive. As you know, I love classic TV, and I also love old as well as current music. So, a lot of my games involve those two things. I hope that will entice you to want to participate. Today’s game is to Identify Songs That Name a Method of Transportation. 3. You have to include the method of transportation. 4. You have to include the line in the song that references transportation. 7. The song title does NOT have to feature the mode of transportation. So talk to me: Do you love games or hate them? Do you think you’ll be playing with me this month or abandoning me until October? Are you looking forward to the spooky theme I have planned for next month?